Charlotte Mason promoted handicrafts as an opportunity for children to spend careful attention + neat effort making useful products while encouraging them to build skills that would help them to be industrious adults. Doesn’t that sound noble? While she was suggesting this in the early 1900s, I think they’re still an important part of a classical education. Thankfully they sort of found their own way into our days. At first, I found it difficult to engage my children, especially the boys, with handicrafts. But, the more time we spend doing handicrafts, the more time everyone wants to. I see their character developing right along with their increasing skills and enjoyment. I learned that having supplies for handicrafts easily accessible and myself available to work alongside them has made all the difference. I don’t schedule handicraft time in our regular routine, but I do give space for them throughout our days or when the interest strikes. It’s often a domino effect in our home. When one is interested, the excitement picks up steam among the littles and pretty soon they’re all sitting around working a project with their hands. I love when it happens. I imagine it happening even more as the weather turns colder here and we’ll be inside more. It works best for us when three are working independently and I can focus on working with one. We’ve tried each of these and they are all hits with my crew (of 10 ,8, and 6 year old boys plus my 4 year old girl). 1. Pom-pom makers: These are seriously fun. Some inexpensive yarn, a little bit of time wrapping, snip snip, and wallah – pom-poms! From here, the list of projects I can think to make with the pom-poms is endless (bookmarks, garland, gift wrap embellishments, hat topper, etc), but they’re also just fun all by themselves. My guys throw them around the house and don’t do any damage. Perhaps one day we’ll take our yarn and try finger knitting. 2. Loom: On one of my parents’ trips to visit us, my mom brought my childhood loom out of her bag hoping my kids would enjoy it. I bought a bag of stretchy loops from Amazon and we began. My 10 year old can do this independently, but my younger ones like for me to assist them. After a lot of time concentrating, it can be a bummer when one pops off the loom (which happens pretty easily), so I understand they like a little security in having my hands involved. They’ve made baby doll blankets and little bags from them, although I guess technically they’re all potholders. 🙂 You wouldn’t know it from all the ways they’ve invented to play with them. 3. Whittling: Over the span of a few years, we’ve given our three bigger boys pocket knives of their own. We learned quickly that our 6 year old is not ready to use the actual knife part, so he practices whittling using the metal nail file on it. (Your 6 year old might be, ours just tends to get distracted and knick his hands a little. Eek!) Along with the knives, we also gave them a pack of soap bars. Since soap is so soft it makes for a gentler, easier introduction to whittling. A magazine we picked up at Home Depot provided instructions for fun projects they could do whittling. But mostly my guys just love skimming sticks from the yard while I read to them. My girl has adapted to her lack of pocket knife ownership by using a thick, short stick to scrape at a longer, skinnier stick. When she’s old enough, we’ll happily give her one too. For us, “old enough” is looking like 8 years old, but it could change depending on the child. I was nervous giving them knives at first, but when they’re whittling they really settle in and concentrate on the task at hand. They’ve made little arrowheads, s’more sticks, and wooden daggers, but most importantly for me they’ve learned to be safe and responsible with a potentially dangerous object. 4. Perler beads: Friends’ children started doing these first and I remembered them from my own childhood fun. I was interested in trying them with my crew, but thought perhaps it would be too meticulous for their liking. Well, I was half-right. It was too meticulous and high maintenance for them – at first. They would start building, become frustrated if the result didn’t exactly match the picture in their head or if they (or oh no, someone else) bumped the board and sent the beads spilling. It was kind of a big, dramatic deal around here full of tears and frustrated hand wringing that left me wondering why I thought these were a good idea in the first place. But then with a little time, it all changed. And not by my doing. We finished the ones we started then put the beads on the shelf for a while. Eventually the boys brought the beads out on their own and started working with them again. I gave suggestions about taking breaks if frustrated and putting the boards somewhere “safe” (i.e. away from little brother’s hands or little sister’s twirling). They did that. Gradually their stamina for the work and their endurance through the frustrations increased. They’re understanding more about how the designs work and are more willing to dump a board and start again whether by choice or by accident. They’re also very creative in their designs and always proud of their work in the end. I think Charlotte Mason knew that developing their hands also developed their minds and characters. 5. Paper airplanes: I’m especially fond of the kits which come with their own paper and instructions, because the boys can mostly complete them on their own or by helping each other. I could see us trying origami soon too. 6. Play-doh: Do we consider this a handicraft? I’m not sure if it’s official, but I’d say so. My daughter is learning mastery of all sorts of handtools with playdoh, like scissors, a rolling pin, and dull knife. 7. Stitching: I think somehow I found this idea pre-Pinterest. Well, at any rate, I can’t recall the source, but all you need is an embroidery hoop, some muslin, a large plastic embroidery needle, and some yarn or embroidery thread. I like to thread the needle for my littles and tie a bead on the end to prevent the thread from coming through the back of the fabric. The hoop holds the fabric taunt and makes it easy for little hands to push the needle through. The hardest part for them is remembering to pull the thread all the way through the fabric before going back through the other side. It just takes practice. All of my children have quite contentedly passed some time sewing this way and learned the basics of stitching. My big boys are probably ready for some more detailed stitching, but we haven’t done that quite yet. 8. Watercolors: I think watercolors are a beautiful medium for learning about color mixing, brush strokes, and paint saturation. I love setting up my crew with little cups of water, a palette of colors, and a paper towel for drying their brush. We do this often while I’m reading aloud. Sometimes I ask them to paint a scene from what they’re hearing and other times they just paint from their imagination. It’s fun for them and simple clean-up for me in the end. I should mention that I have one guy who sits and watches if anyone is using 4 or 5 out of 7 of these, but has no interest in them himself. I don’t push him, but encourage him whenever he expresses interest. I’ve definitely seen him improve at attending a task even with him spending less time doing them than the others. 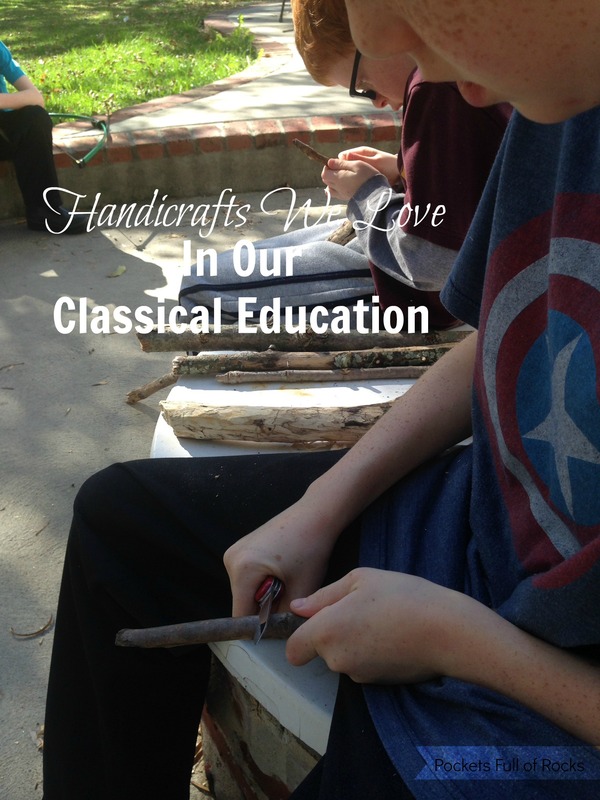 Classical Conversation families, we especially like doing handicrafts while listening to our CC memory work cds. I can’t do a post on handicrafts without mentioning these trays which make set-up and clean-up easier every time. Want to learn more about handicrafts as explained by Charlotte Mason? 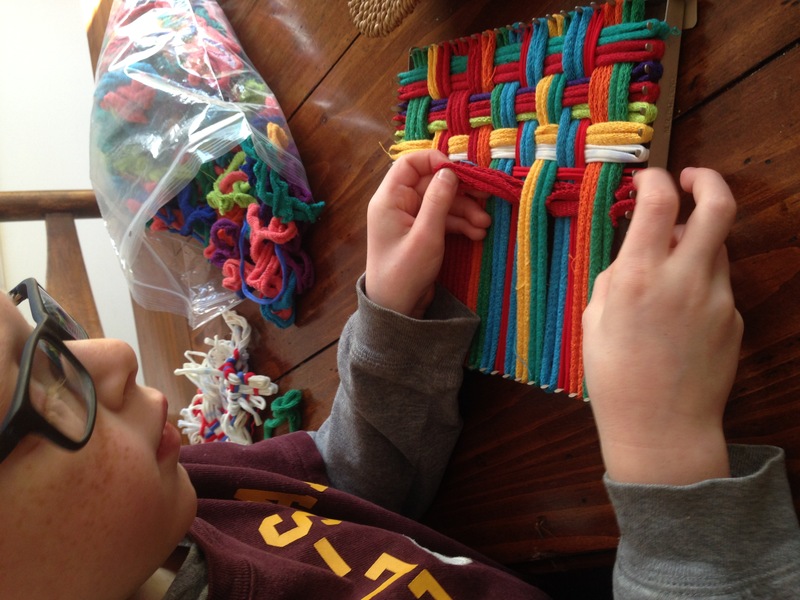 Check out these articles: Handicrafts and Handicrafts and Life Skills.